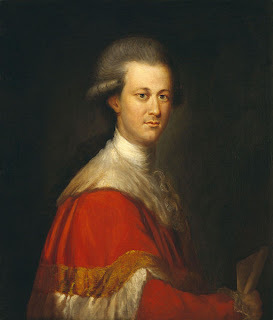 He was speaking of the mysterious circumstances attending the death of Thomas, Second Baron Lyttelton, known in true Georgette Heyer fashion as ‘the wicked Lord Lyttelton’, born 30 January 1744, and died - as we shall see - on the night of the 27th November 1779. Lyttelton was educated at Eton and Oxford, a charming and talented boy; too charming and talented for his own good, perhaps, for he became a notorious rake. He fought duels, and ‘excelled the ordinary model of young debauchery everywhere’. He married to pay his gambling debts and then ran off to Paris with a barmaid; he entered the House of Commons in 1768 as MP for Bewdley, but was unseated for bribery the following year; he disappeared again to the Continent; but when his father died in 1774 he returned and took his seat in the Lords where, to secure his support, ministers bought him over with a lucrative sinecure – something which would pay him money and for which he would have to do little or no work – the ancient post of Chief Justice of Eyre beyond the Trent. He was correct. By midnight on November 27th, he was dead. Lord Lyttelton is dead suddenly. …The story is given out, that he looked ill, AND HAD SAID HE SHOULD NOT LIVE THREE DAYS; that he had gone to his house in Epsom… with a caravan of nymphs; and on Saturday had retired before supper to take rhubarb; returned, supped heartily, went into the next room and died in an instant. Within a short time, however, Walpole has picked up on the gossip around town: Lyttleton had claimed to have seen a robin – or some other bird – which changed into a woman and delivered him a death warning. By December 11th Walpole writes with dry humour to another friend that ghost stories are back in fashion! Lord Lyttelton’s vision has revived the taste; though it seems a little odd that an APPARITION should despair of getting access to his lordship’s bed, in the shape of a young woman, without being forced to use the disguise of a robin red-breast. On November 25th, at breakfast in Hill Street, Lord Lyttelton told the young ladies and their chaperon that he had had an extraordinary DREAM. He seemed to be in a room which a bird flew into; the bird changed to a woman in white, who told him he should die in three days. He ‘did not much regard it, because he could in some measure account for it; for that a few days before he had been with Mrs Dawson, when a robin red-breast flew into her room.’ On the morning of Saturday [the 27th] he told the same ladies that he was very well and believed he should ‘BILK THE GHOST’. On that day – Saturday – he …went to bed after eleven, ordered rolls for breakfast, and, in bed, ‘died without a groan’ as his servant was disengaging him from his waistcoat. Myself, I'm particularly taken with the juxtaposition of the caravan of nymphs and the rhubarb, and with Walpole's crack about the spirit not really needing to disguise itself as a robin to get into Lyttelton's bed... There was no inquest. And there's a postscript: on the fatal night, 27th November 1779, Mr Miles Peter Andrews, a friend of Lyttelton’s who was staying at Dartford, was woken when his bed-curtains were pulled open and he was confronted by Lord Lyttelton ‘in his robe de chambre and nightcap’. Suspecting a practical joke, Andrews rang the bell for his servant, and on turning back found Lord Lyttelton gone. The house and garden were searched in vain, and about four in the afternoon of the next day, a friend arrived with news of Lyttelton’s death. The event was recorded in the next number of the Scots Magazine, December 1779. “I like to have more!” Dr Johnson growls. What an interesting story, Kath! Thank you.